Can you believe we have been reading novels for The Bestseller Code 100 Challenge for nearly a year now? We started our first book on November 7, 2016 and we have read 25 bestselling novels so far. 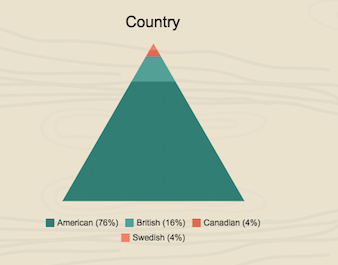 Let’s take a look at a few summary statistics for the first twenty-five books. This analysis was prepared by both Karen and Roberta. 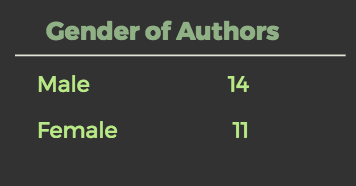 Does the gender of the author influence whether a book becomes a bestseller or not? If we count J. K. Rowling’s The Cuckoo’s Calling as written as a female, then the split is about even with 14 males and 11 females. If we count The Cuckoo’s Calling as written by a male, Robert Galbraith, then it would be 15 males and 10 females. It will be interesting to see how this ratio changes as we read more of the list. Can we conclude that authors prefer to write main characters that match their own gender, writing what they know? It will be interesting to track this statistic as we read through the remainder of the list. One might expect that more experienced authors would be more likely to write a bestseller. 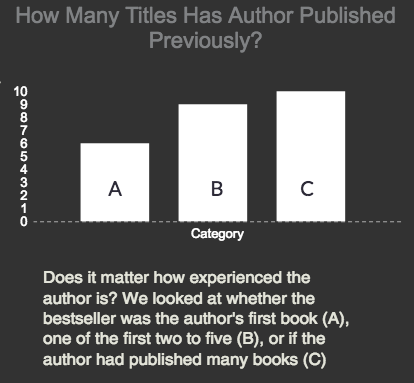 Thus, a majority of the titles on the list should come from authors who have published more than five novels. Surprisingly, six of the twenty-five novels were the author’s first or debut novel. Nine were from authors who had published only two to five novels. Once again, J.K. Rowling’s The Cuckoo’s Calling is problematic. We counted her as an experienced author, even though Robert Galbraith was supposedly a debut author. Also, Stieg Larson’s book was the third of a trilogy, but it was written before he published the first. We included him in the “few” category. Apparently experience is not a primary factor, at least so far. If it were, we’d expect that a vast majority of the books would be by authors with more than five novels. Assigning a novel to a genre is becoming more and more tricky as many novels cross boundaries. We considered four of the titles to be literary fiction. 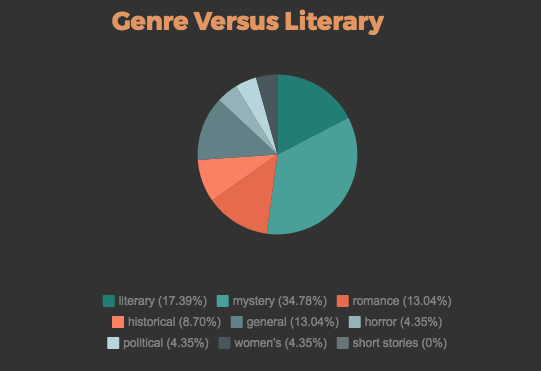 Of the titles that fit the genre category, eight of the titles could be considered to be mystery/suspense/thriller, making it the most popular genre so far. Do bestselling authors all have a degree in English or creative writing? Although most of the authors had degrees in the liberal arts side of the college, not all studied writing. In fact, five of the twenty-five had degrees in writing, plus another four with degrees or careers in journalism. That is roughly 36%. 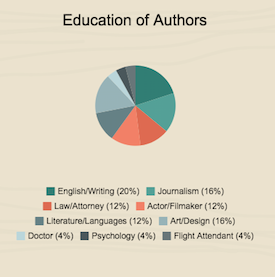 Surprisingly, 12% studied law, and another 12% were actors or filmmakers before taking up writing novels. Of those with no background in the arts, one was a doctor, one had psychology training, and one worked as a flight attendant. Because the bestsellers were from The New York Times list, it is not surprising that the vast majority (76%) of the authors were Americans. After having read the 25 bestselling novels for this challenge, we need to ask ourselves if it has been worthwhile. Here are some of our insights. At the beginning we expected that we would enjoy reading most of the books because they are popular bestsellers. We are both book lovers and readers, so it seemed to be a reasonable expectation. We were both surprised to learn how many of the books we did not enjoy. Although our tastes are similar, we have not always agreed on how well we liked a certain novel, either. We learned that there is more to enjoying a bestseller than simply good writing or an interesting plot, and that humans need stories that resonate with us as individuals. We found out that being able to reach a broad audience in a meaningful way is quite an art. Although we have had to hold our noses and keep reading at times, by persevering we have learned more about literature and writing. We have been exposed to a diversity of formats and styles. We’ve read epistolary novels, bestiaries, and novels written from the perspective of a dog. We’ve also become a bit more literary. Now when someone mentions World War Z in a conversation, we can give an informed opinion, and not from watching the movie. We’ve also stepped out of our comfort zones, reading novels in genres we don’t usually consider when looking for something to read. The Girl Who Kicked The Hornet’s Nest was a far cry from Karen’s first love, historical fiction, yet she was enthralled with the characters and quickly read the entire trilogy. And The Mountains Echoed was definitely not a detective novel or murder mystery, but Roberta found it breathtaking. By reading books in genres outside of our norm, we’ve both discovered some new favorite authors. What about you? 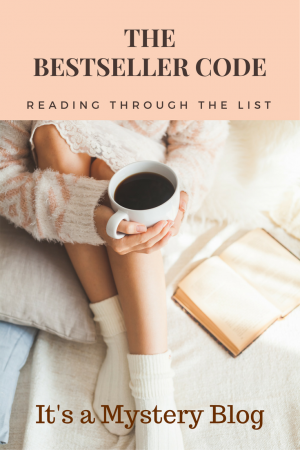 What nuggets have you discovered from reading The Bestseller Code 100 list? All in all, we are looking forward to discovering the next twenty-five bestsellers. We hope you decide to read them with us. This post contains spoilers about State of Wonder. Join the main discussion here. 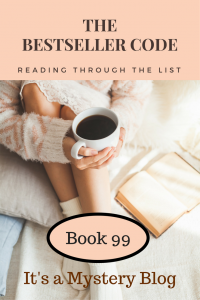 As part of our challenge to read through the 100 Bestseller List presented in The Bestseller Code, I read Ann Patchett’s State of Wonder (Book #99 on the list). In State of Wonder, Dr. Marina Singh works for a pharmaceutical company in Minnesota. The story begins with her boss/lover, Mr. Fox, reading her a letter stating that her co-worker and friend, Anders Eckmann, has died of a fever at the company’s research site in the remote Amazon jungle. Dr. Eckmann was sent to Brazil to discern the progress of research into a fertility drug, research led by Dr. Annick Swenson. Since Dr. Swenson was an early mentor of Marina’s, Mr. Fox believes that Marina will be able to complete Eckmann’s mission and bring back the information. So, he sends Marina to Brazil. This book couldn’t have been more different from our previous read, Shutter Island, #100 on the list. Whereas Shutter Island grabbed my attention from the very beginning, I felt quite literally like I was slogging through the Amazon jungle, hacking a pathway through the first third of State of Wonder. Was this the author’s intent, leading the reader to feel they had left the modern world behind for the slower pace of the jungle? If so, it didn’t work for me. Instead, I found myself skimming the story, trying to fast forward in hopes of discovering a reason to keep reading. When I finished reading, I was in a “state of wonder” – wondering what the story was about and why I’d read it. Wondering how the computer algorithm from The Bestseller Code could have chosen this book, which was so different from Shutter Island, as a bestseller. Obviously I missed the point of the story somewhere, possibly taking a wrong turn down a tributary only to be lost in the jungle. So I picked the book back up and starting rereading it at Chapter Five, which is where Dr. Swenson appears. And I’m glad I did that. Several of the story lines became clearer to me on the second read through; I paid closer attention to conversations, and found some answers I had previously missed. Ann Patchett explores several important topics in State of Wonder – the impact of the modern world upon the Amazon and its inhabitants, the priority pharmaceutical companies place on developing new drugs for profits over the beneficial impact upon humanity, the need humans have to feel that they belong culturally, and more. It’s all there, if you care to cut through the vines and peer through the murky waters. Will I read another Ann Patchett novel? Normally, I’d say no. But I do wonder if all her books are similar in character development, plot pace, etc. I’m open to suggestions. Post your favorite Anne Patchett novel in the comments, along with why you recommend it. And if State of Wonder is your favorite, kindly tell me what I missed! The next book is number 98 on the list, Primary Colors by Anonymous, Joe Klein (1996) – Discussion begins December 5, 2016. We are launching an exciting new challenge. Let’s read through the list of 100 bestsellers picked by the computer model described in The Bestseller Code by Jodie Archer and Matthew L. Jockers (Review in a previous post). After sorting through 20,000 novels from the last few decades, Archer and Jockers used their computer model to pick 100 books that are the best of the potential bestsellers. The list contains novels from a mix of genres. Many you will recognize, some you may not. Currently you can see book numbers 100 through 90 at the 100 Book List link in the navigation bar. Check with the 100 Book List tab in the navigation bar at the top of the blog for our reading list and links to all the discussions. We’re starting with number 100 on the list, which is Shutter Island by Dennis Lehane. Pick up a copy and read it over the next two weeks. If you have a blog and want to do so, post your thoughts. On November 7 we’ll publish a post to start the conversation and to gather links (now published). No blog? No worries. We’ll have plenty of ways for you to join in. Also, during the week your host Karen will discuss the featured title from the reader’s perspective and host Roberta will take on the writer’s perspective. Don’t worry if you’re doing NaNoWriMo or can’t get to the book in two weeks. Pour a cup of your favorite beverage and stop by any time. Find the conversation on social media: We’ll be using #BestsellerCode100 on Twitter, discussing at The Bestseller Code 100 Facebook Group and posting to The Bestseller Code 100 Pinterest Page. Join us every other Monday for a new book from The Bestseller Code 100.